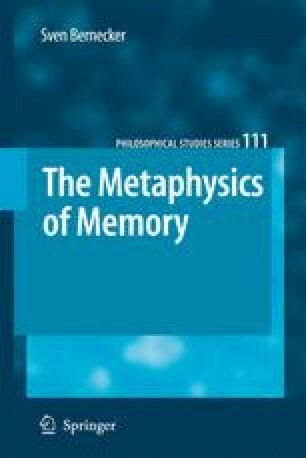 The aim of the present chapter is to provide a positive account of the causal relation responsible for information retrieval from memory. Anticipating the conclusion, for a memory trace to give rise to genuine remembering its content must be an independently sufficient condition (that is not preempted by another independently sufficient condition) of a state of recounting or at least a necessary condition of such an independently sufficient condition. Section 4.1 discusses various approaches to memory causation. These approaches are the analysis in terms of necessary and sufficient conditions, the counterfactual analysis, and the probabilistic analysis. Section 4.2 provides a general characterization of retrieval cues. Given that we may remember only after being prompted what is it for us to remember an event upon being prompted, rather than merely parroting the prompting? This is the topic of section 4.3. This section also discusses the question of whether the recountings of a highly suggestible agent may qualify as remembering. Finally, in section 4.4 I distinguish my account of the causal collaboration between traces and prompts from an account proposed by Charles Martin and Max Deutscher.